The Los Angeles Metropolitan Transportation Authority (Metro) has unveiled six potential alignments for a forthcoming transit project that could link L.A.’s San Fernando Valley with the city’s Westside neighborhoods and—eventually—with Los Angeles International airport (LAX). The concepts were unveiled last week and represent the latest efforts to span over the Sepulveda Pass with public transit, an effort that is complicated by the route’s steep terrain, the presence of the Santa Monica Mountains, and the presence of Interstate-405, the busiest and most congested freeway in the United States. Plans call for building the link in two phases, with an initial segment connecting the Westwood with the southernmost edge of the valley due to be completed by 2026. A southern extension to LAX could be completed by 2057 under the current timetable. Planners envision a 10-mile underground subway alignment that would link the future terminus of the regional Purple Line subway with the Orange Line busway in the valley neighborhood of Sherman Oaks, where the line could link with a forthcoming north-south transit route planned for Van Nuys Boulevard. 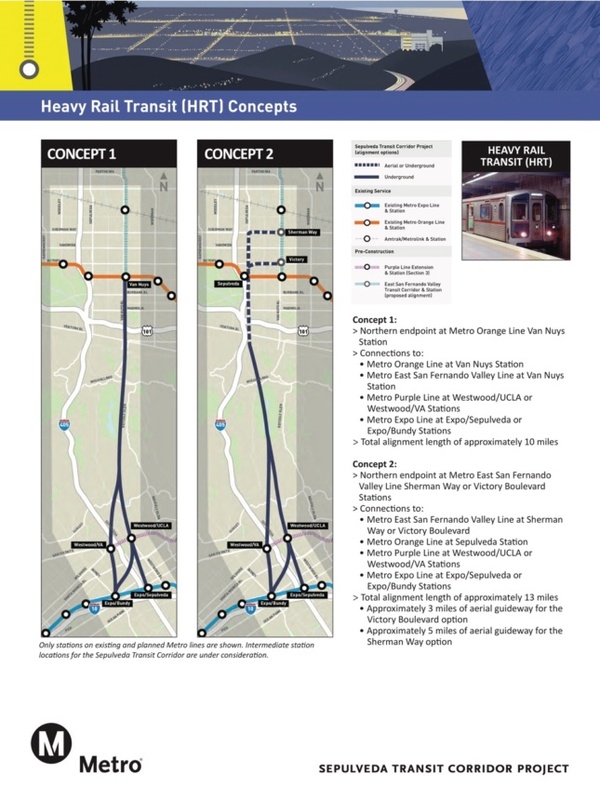 To the south, the new heavy rail transit line (HRT) would also link with the east-west Expo Line that connects Downtown Los Angeles and Santa Monica. 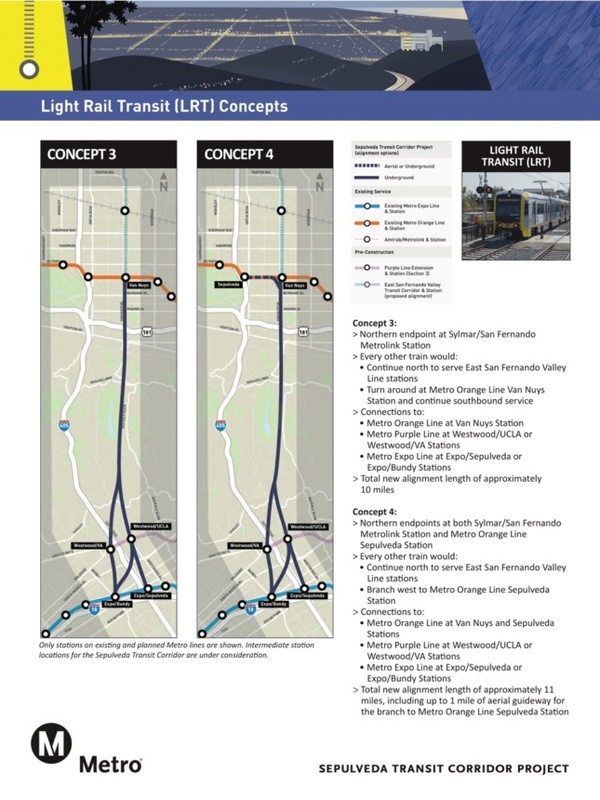 A second potential HRT line would follow a similar tunneling route but would connect with the Orange Line station on Sepulveda Boulevard instead of Van Nuys. The potential alignment could contain as many as five miles’ worth of aerial alignments constructed to link separately with the forthcoming Van Nuys Line, as well. This route would run a total of 13 miles in length and could connect to the Expo similarly to Concept 1. This alignment would follow the same path as Concept 1 but would be built using light rail transit (LRT) technology, a cheaper option that would ultimately carry fewer passengers per train at slower speeds than the HRT proposal. The underground route would ultimately run about 10 miles in length. This route would run along the same alignment as Concept 3, but would feature a mile-long aerial spur that would link to the Orange Line. 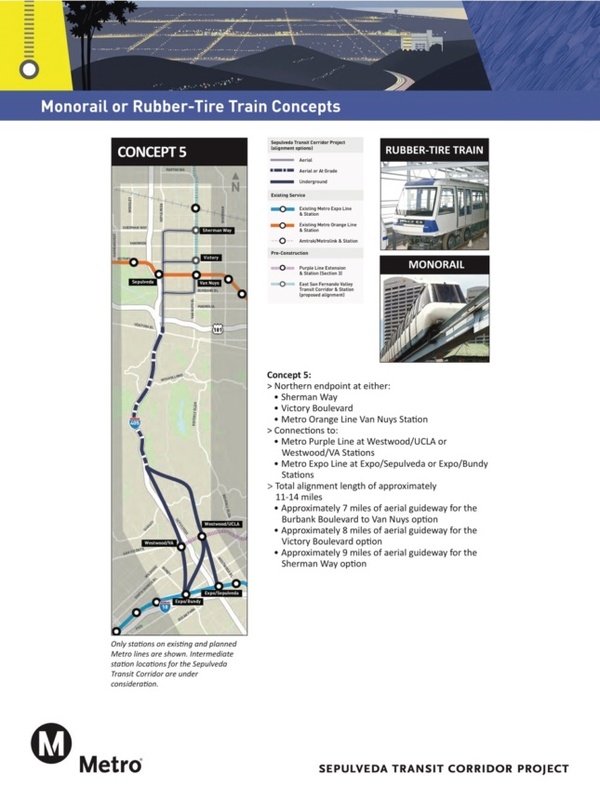 Plans are currently underway to convert the Orange Line from a bus rapid transit route (BRT) to a light rail line, meaning that, with this option, the two routes could potentially share trains in the future, creating the possibility of several different one-seat routes. Metro is also considering monorail and rubber tire trams for the Sepulveda Pass route, options that would blend below-ground, at-grade, and aerial alignments to cross through the mountain range. Concept 5 would follow the same route as Concept 1 but would result in a transit line that simply linked the two regions without offering the interlining capabilities of Concept 4 or the capacity and speed of Concepts 1 and 2. 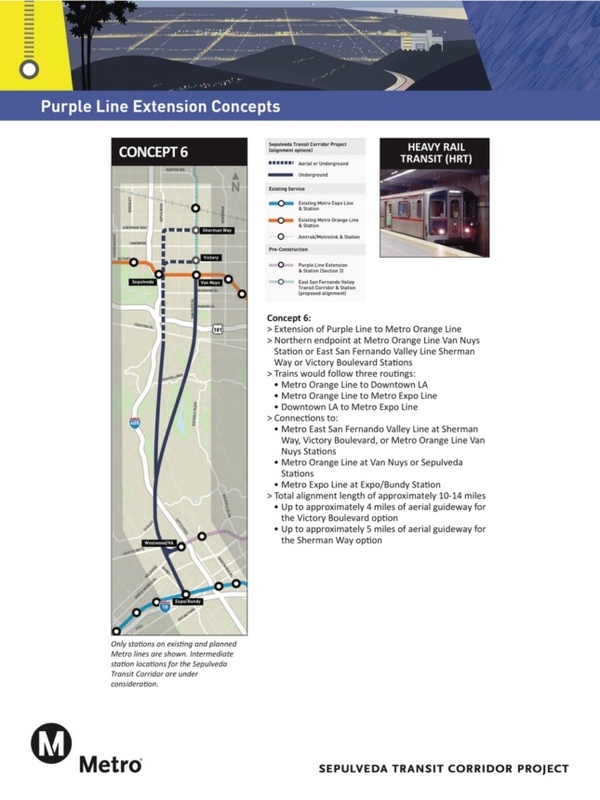 Concept 6 is proposed as an extension of the Purple Line route, an idea that would thread the primarily east-west line northward into the valley, where it could link with other forthcoming lines or even extend further in their stead. The potential alignment would be the death knell for the “Subway to the Sea” concept originally proposed for the Purple Line that would have extended the line to Santa Monica. That idea has been on the back burner for years as Metro has moved ahead with planned extensions that take the route only as far west as Westwood, where the line simple dead-ends. Metro will be gauging public opinion on the routes over coming weeks and will announce a consolidated list of route options at a later date. 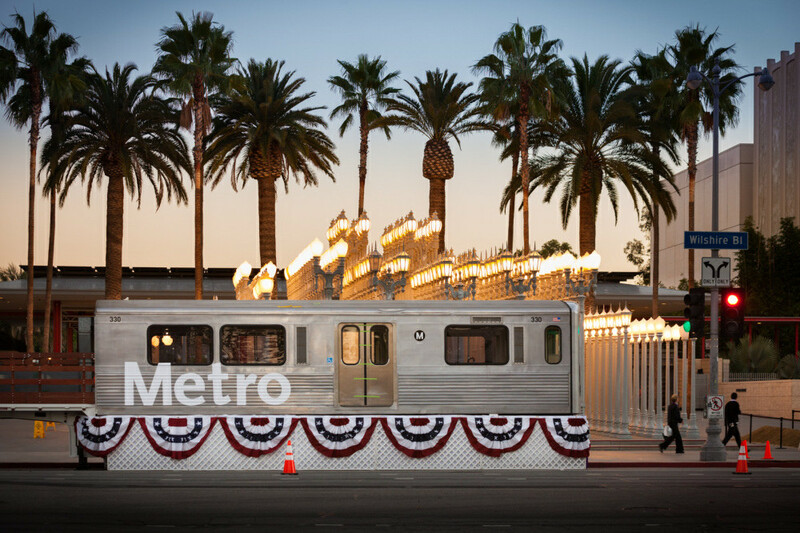 The route is listed as one of the 28 transit projects Metro would like to complete before L.A. hosts the 2028 Olympics, so the timeline for the project will likely be sped up over the coming years.